TRIVIA of Noh : Q65 : What kind of characters appear in Noh? 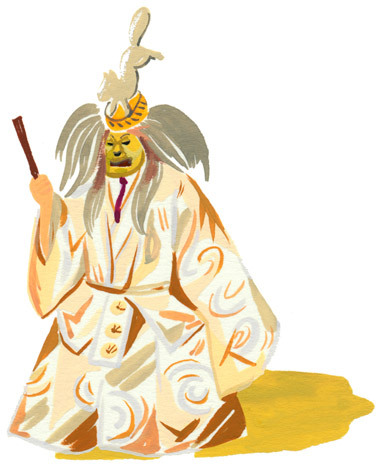 | Home | Trivia | Q65 : What kind of characters appear in Noh? What kind of characters appear in Noh? Not only real people, but many other beings appear on the stage of Noh. Animals, spirits and demons, plants, supernatural beings, and ghostly powers also often appear. And not just regular animals, but unimaginable monsters with the heads of monkeys, paws of tigers and tails of snakes also appear. In kyōgen, the character of a fox appears in a fox mask and the character of a monkey in a monkey mask, but in Noh the characters are revealed symbolically through the design of the mask or costume, representing something that is not quite human. For example, the fox of Inari Shrine that appears in the play Kokaji wears a crown-like attachment on its mask and costume designed to show that it is a fox. In this way it takes on a more ghostly nature than an actual fox. Being able to recognize the hidden meaning in the costumes and appearances of the characters, be they foxes or demons, is another unique way of enjoying Noh.